I don't know what to feel about this book. On one hand, Point of Retreat is a great sequel to Slammed, and delivers a great story line and continues to introduce us to amazing characters. On the other hand, it's so drama-lhama! 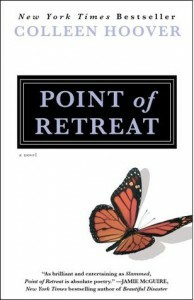 There is just too much going on, and it's presented in two parts, which made me feel like I was reading two completely different books.Point of Retreat is told from Will's point of view, and I initially loved it! I really wasn't expecting him to be as intense as he though, and I was quickly swamped under his bull-headedness and desperation. I think the most interesting thing is seeing Layken, Kel, Eddie and other characters through his eyes. I also liked getting to see Lake and Will after their happy ending - most books and series end with the couple getting together, and rarely explore how to actually be in a relationship. It's something these two struggle with, and it doesn't help when Will's past comes back to intrude in the worst way.One of my favourite parts is getting to see little Kel and Caulder grow up - they're so adorable and lively and brave and strong. I think they're amazingly written characters, made all the more hilarious because of their new friend and neighbour Kiersten. She turns out to be wiser and more mature than any other eleven-year-old in existence.However, I struggled with just how much was going on throughout the book. Will and Lake's struggles to act as parents to their brothers, balance their relationship and their obligations at home and at school, deal with Will's past and resulting insecurity should have all been enough, but then the book takes a completely different direction and I didn't really know what to make of it. It was still engaging, but I think I was emotionally wrung out.Point of Retreat is a great book, and I enjoyed reading it immensely. It just didn't grab me like Slammed did, and I find myself a little disappointed at the melodrama that permeated the story. 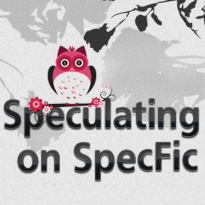 However, I will be reading the third instalment, This Girl, in this great series later this year.You can read more of my reviews at Speculating on SpecFic.